Not all seeds are destined for the soil. Add these pint-sized nutritional powerhouses to your diet for super-sized health benefits! With all the buzz around the myriad health benefits of nuts, it's easy to overlook their even more diminutive counterparts. I'm talking about seeds, which prove that big things come in small packages. In fact, many seeds are absolute nutritional giants! As a fitness fanatic, you're probably looking for any dietary edge you can find to keep your physique and health in tiptop shape. Replete with healthy fats, protein, and a range of micronutrients, seeds can be your secret weapon to eating better than ever. Think of them as pint-sized foods with super-sized benefits. These six seed powerhouses have been nourishing cultures around the world for many years; it's time to add them to your diet, too! Trust me: There's not a bad seed here. Who would have thought that a seed once used to power Aztec armies and then to grow Homer Simpson and Mr. T terracotta pets would become a modern-day superfood? Well, we pity the fool who doesn't include these nutritional overachievers in his training diet. For starters, chia is a fiber heavyweight—a mere tablespoon serving delivers 5 grams! In fact, all of the chia seed's carbohydrates are in the form of dietary fiber, making the diminutive seeds that much more six-pack-friendly. When the fiber in chia mingles with the digestive liquids of your gut, it's thought to swell and form a gel, which can aid in improving blood-sugar control and promote satiety to help keep your junk-food temptations at bay. When the fiber in chia mingles with the digestive liquids of your gut, it's thought to swell and form a gel, which can aid in improving blood-sugar control and promote satiety to help keep your junk-food temptations at bay. 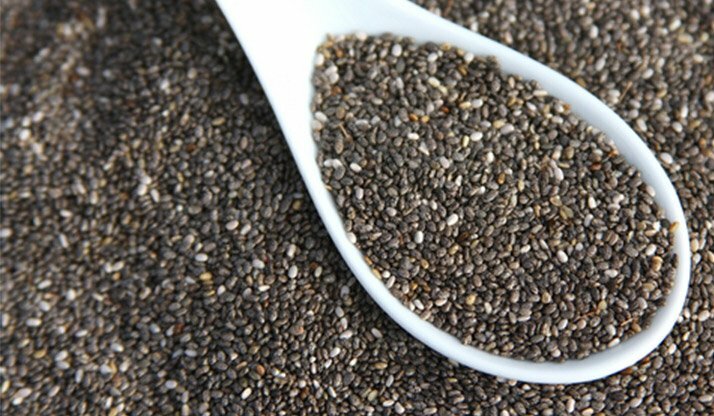 Chia is available in both black and white hues, but significant nutritional differences between the two have not been demonstrated. Chia seeds have a fairly benign flavor, so you can add them liberally to items like cereal, yogurt, cottage cheese, and salads without impacting the taste of the dish. Since chia is hydrophilic—it absorbs several times its weight in water—you can use the seeds to create healthy fruit spreads and puddings. Chia gel is also used in vegan baking to act as a binder in lieu of eggs. Soft-to-the-bite hemp seeds—also called hemp hearts—can show your muscles some love by providing high-quality plant protein. A study by Canadian researchers discovered that the Protein Digestibility Corrected Amino Acid Score (PDCAAS), which speaks to the protein value of a food, is greater for hemp than what's found in a number of other plant foods such as grains, nuts, and legumes.3 This is because hemp contains the full arsenal of muscle-building essential amino acids like you'd find in meat, eggs, and dairy. Hemp seeds are loaded with a range of vital minerals including energy-boosting iron, bone-building calcium, and magnesium. As a bonus, hemp contains a 3:1 ratio of omega-6 fat to omega-3 fat, which is considered to be anti-inflammatory in the body. Many people eat too many omega-6 fats via cheap vegetable oils, which can encourage inflammation in the body and set you up for poor exercise recovery and heightened disease risk. I've said it before, but it's worth repeating: The chances of failing a drug test because you add handfuls of hemp seeds to your oatmeal is as likely as Florida being awarded the Winter Olympics. That's because the variety of hemp grown for food production is different than the one that made Cheech & Chong famous. Hemp seeds are blessed with a tasty flavor that hits the tongue like a lovechild of pine nuts and sunflower seeds. Add them to everything from oatmeal to protein shakes to soups to salads. Jack-o'-lanterns definitely shouldn't be your only exposure to these nutritional dynamos. When the white outer hulls are removed to reveal their verdant interiors, pumpkin seeds are also known by their Spanish name—pepitas. Their high levels of healthy unsaturated fat can keep your body a well-oiled machine, so to speak. The bevy of nutritional benefits from pumpkin seeds also includes good amounts of iron, magnesium, testosterone-boosting zinc, and vitamin K.
You can choose raw or roasted pumpkin seeds, but to keep your sodium in check, opt for those that are unsalted. Try toasting pumpkin seeds in a dry skillet over medium heat until they begin to pop, and then use them to garnish oatmeal, yogurt, soup, stir-fry, and salad. Also use them in homemade energy bars and granola. When ground, pepitas make a great coating for meats like chicken and tilapia! As one of the first foods to be awarded superfood status, flax seed remains a nutritional giant despite being pushed aside by more trendy edibles like coconut and the latest Amazonian berry du jour. Flax is one of the best dietary sources of soluble fiber. By helping to slow down digestion, soluble fiber can help in the regulation of blood sugar and appetite, two benefits that can go a long way in stopping flab before it starts. A 2015 large review of studies published in the journal Clinical Nutrition found that the consumption of flax aids in keeping blood-pressure numbers from boiling over into an unhealthy range that raises the risk for cardiovascular disease.6 The researchers surmised that the biological mechanism could be linked to the high levels of lignans in flax. Lignans are plant compounds that may help improve blood flow in the body. Flax is one of the best dietary sources of soluble fiber. 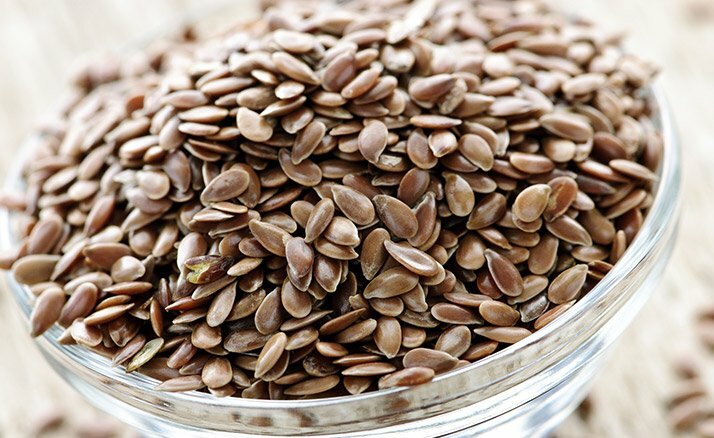 What's more, flax is a leading source of the omega-3 fatty acid alpha-linolenic acid (ALA). While not as powerful as the omega-3s found in fatty fish like salmon, ALA can also help keep your ticker beating strong so you'll be pumping iron well into your golden years. Whole flax has a hard outer shell that makes it difficult for our digestive tract to break into. For this reason, flax needs to be ground into a powder if you want to properly access its nutritional goodness. So when you see those loaves of bread or boxes of cereal that trumpet the inclusion of flax, but all you see are a scattering of whole seeds, you can be certain that most of those seeds will be going straight through your system. You can purchase preground flax, which should be stored in the refrigerator or freezer to maintain freshness. Alternatively, buy whole seeds and grind them yourself using a spice or coffee grinder. Stir ground flax into warm cereals or blend into your post-training shakes. The next time you're making a batch of pancakes or waffles, try swapping out about a quarter of the flour for ground flax. You can also whisk some flax into salad dressings for a slight nutty flavor. 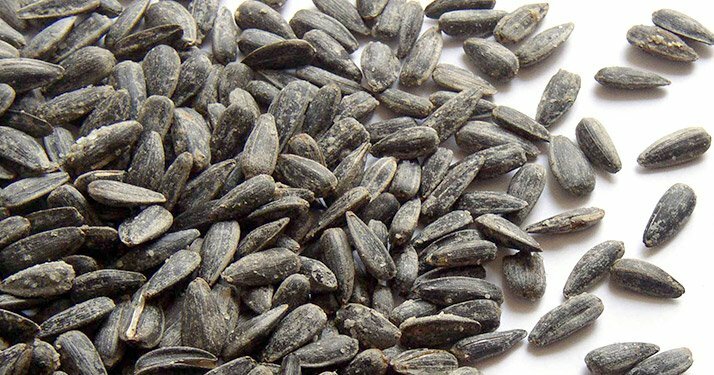 If you're on a tight food budget, inexpensive sunflower seeds can help you meet your nutrient needs without putting a big dent in the savings account. As with other seeds, this seed of the sun-worshiping plant is a stellar source of body-friendly unsaturated fats, along with a range of minerals such as magnesium, copper, and manganese. But the sky-high levels of vitamin E are their nutritional claim to fame. As with other seeds, this seed of the sun-worshiping plant is a stellar source of body-friendly unsaturated fats, along with a range of minerals such as magnesium, copper, and manganese. 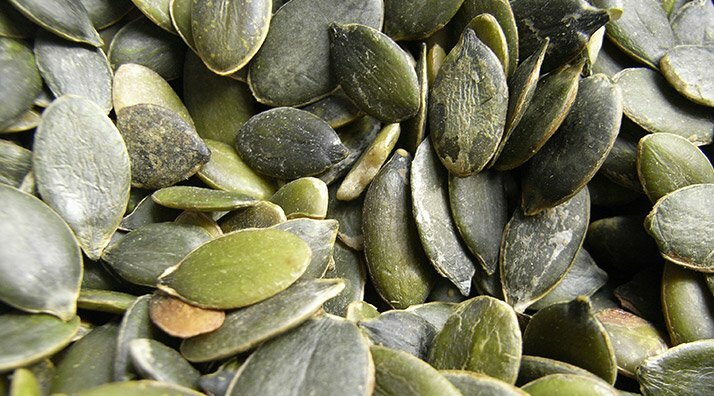 Scientific research suggests that naturally occurring vitamin E from foods like sunflower seeds are more beneficial in reducing the risk for cancer than that obtained via supplementation.8 Acting as an antioxidant, vitamin E may also help improve exercise recovery by reducing training-induced oxidative stress in the body. If portion control is not your strong suit, try buying unshelled sunflower seeds. The act of shelling the seeds should slow down how many you inhale. From cereal to tuna salad to pasta to yogurt to smoothies, a handful of sunflower seeds can add a nutritional boost to a wide range of everyday eats. Also blend them into dips and spreads like pesto. For a healthier diet, it's time to say "open sesame." 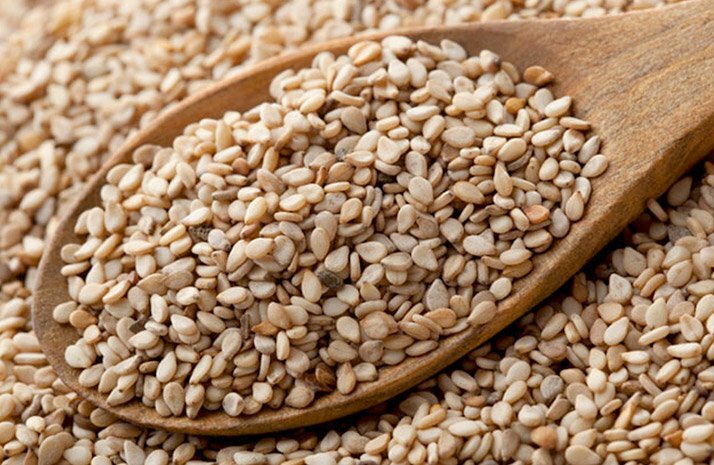 Good for much more than being simply sprinkled on fast-food hamburger buns and bagels, oft-overlooked sesame seeds deliver a dairy-free source of calcium. You've likely heard that calcium is a vital mineral for building bones of steel, but it's also necessary for proper muscle functioning. Good for much more than being simply sprinkled on fast-food hamburger buns and bagels, oft-overlooked sesame seeds deliver a dairy-free source of calcium. Sprinkle sesame seeds into your daily menu and you'll also take in copper, a mineral essential for numerous enzymatic reactions in the body, including those involved in energy production and the performance of your nervous system. Keep an eye our for black sesame seeds, which are thought to possess higher antioxidant activity than the more customary beige variety.9 That's because the pigment that lends the black seeds their dark-as-night hue has antioxidant powers. Of course sesame seeds can make any Asian-inspired dish better, but also use them to add texture to roasted vegetables, grilled salmon, sautéed greens, and even burger mixtures. Olivos-Lugo, B. L., Valdivia-López, M. Á., & Tecante, A. (2010). Thermal and physicochemical properties and nutritional value of the protein fraction of Mexican chia seed (Salvia hispanica L.). Food Science and Technology International. House, J. D., Neufeld, J., & Leson, G. (2010). 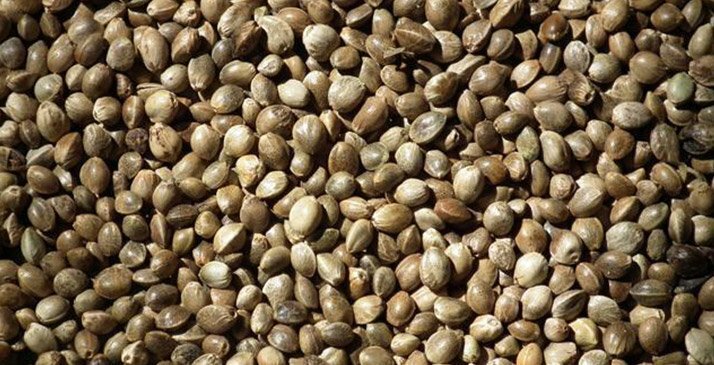 Evaluating the quality of protein from hemp seed (Cannabis sativa L.) products through the use of the protein digestibility-corrected amino acid score method. Journal of agricultural and food chemistry, 58(22), 11801-11807. Del Gobbo, L. C., Imamura, F., Wu, J. H., de Oliveira Otto, M. C., Chiuve, S. E., & Mozaffarian, D. (2013). Circulating and dietary magnesium and risk of cardiovascular disease: a systematic review and meta-analysis of prospective studies. The American Journal of Clinical Nutrition, 98(1), 160-173. Beulens, J. W., Grobbee, D. E., Sluijs, I., Spijkerman, A. M., & Van Der Schouw, Y. T. (2010). Dietary phylloquinone and menaquinones intakes and risk of type 2 diabetes. Diabetes Care, 33(8), 1699-1705. Ursoniu, S., Sahebkar, A., Andrica, F., Serban, C., Banach, M., & Lipid and Blood Pressure Meta-analysis Collaboration. (2015). Effects of Flaxseed Supplements on Blood Pressure: A Systematic Review and Meta-analysis of Controlled Clinical Trial. Clinical Nutrition. Edel, A. L., Rodriguez-Leyva, D., Maddaford, T. G., Caligiuri, S. P., Austria, J. A., Weighell, W., ... & Pierce, G. N. (2015). Dietary flaxseed independently lowers circulating cholesterol and lowers it beyond the effects of cholesterol-lowering medications alone in patients with peripheral artery disease. The Journal of Nutrition, 14(4), 749-757. Yang, C. S., Suh, N., & Kong, A. (2012). Does vitamin E prevent or promote cancer? Cancer Prevention Research, 5(5), 701-705. Hu, Q., Xu, J., Chen, S., & Yang, F. (2004). Antioxidant activity of extracts of black sesame seed (Sesamum indicum L.) by supercritical carbon dioxide extraction. Journal of Agricultural and Food Chemistry, 52(4), 943-947.